St. Matthew’s is the only Lutheran church in Northern California that has weekly services in both English and German. Members come from all over the Bay Area to worship in our beautiful wooden Gothic church. The design was modeled after the founding Pastor Gehrcke’s home church in Hildesheim, Germany. The church has some of the most beautiful stained glass windows of any church in the Bay Area. The window directly above the altar, for example, was a gift of Helene Strybing, who is known to San Franciscans for funding the Arboretum in Golden Gate Park. Another window honors Albrecht Kuner, a German immigrant who came to San Francisco in 1849. He was an engraver by trade and made the engraving for the State Seal of California. Thanks to our beautiful sanctuary with its exceptional acoustics and historic pipe organ, St. Matthews continues to be a focal point for German-language and multi-cultural musical, choral, and community events in the Bay Area. We are located in the Mission District, a vibrant multi-ethnic community in the heart of San Francisco. 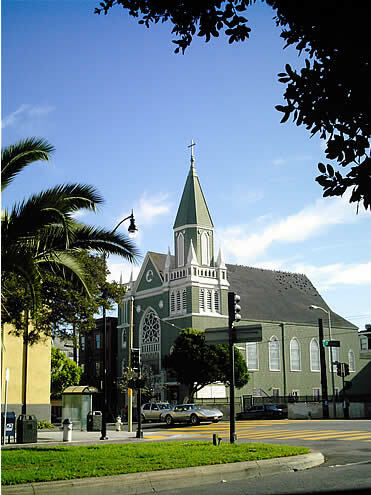 The famous Mission Dolores, across the street from St. Matthew’s, is the oldest surviving structure in San Francisco. It was dedicated in 1791 and survived the 1906 earthquake which destroyed much of San Francisco.